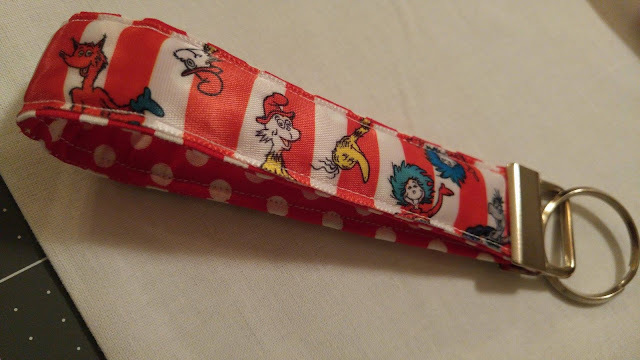 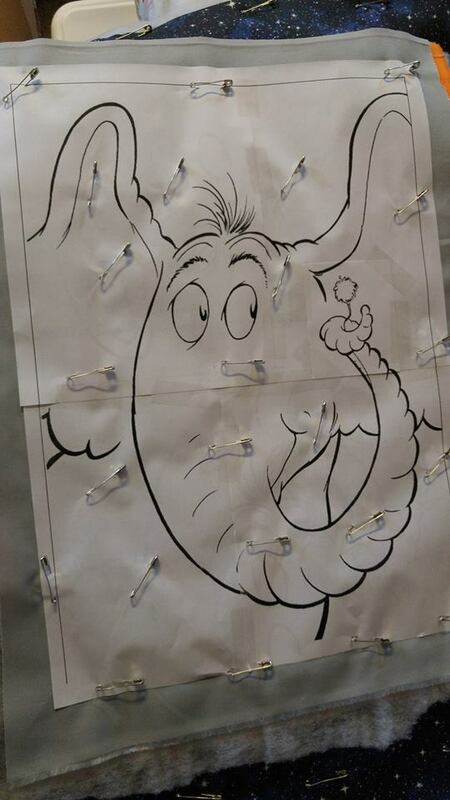 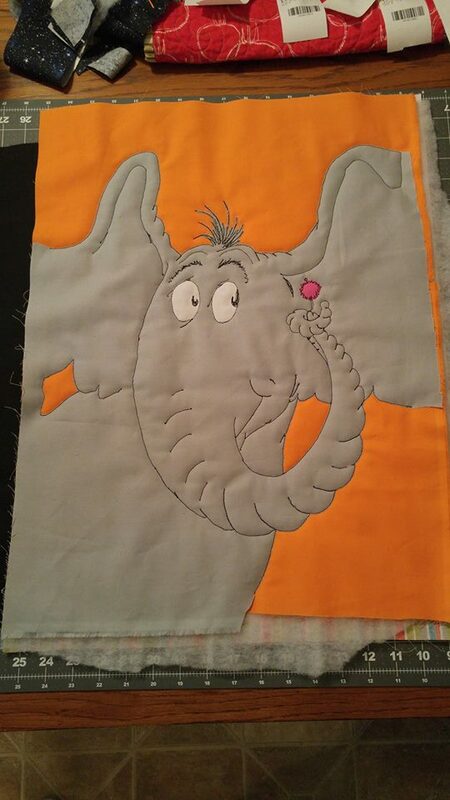 My assigned recipient said that Horton was her favorite Seuss character. 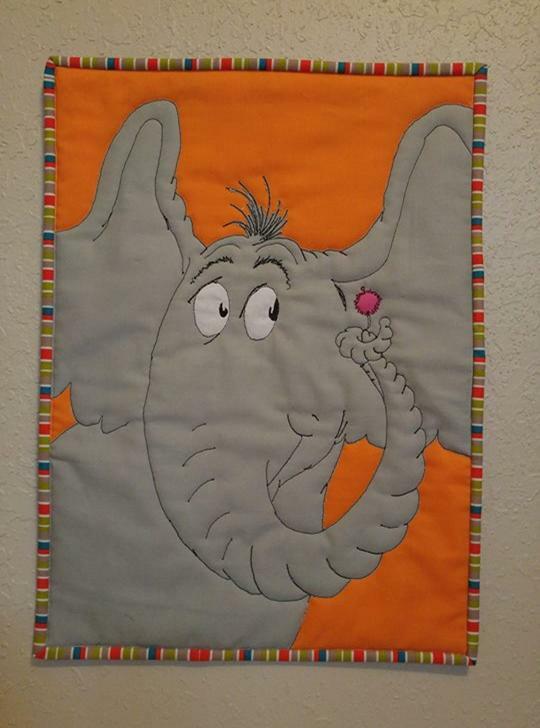 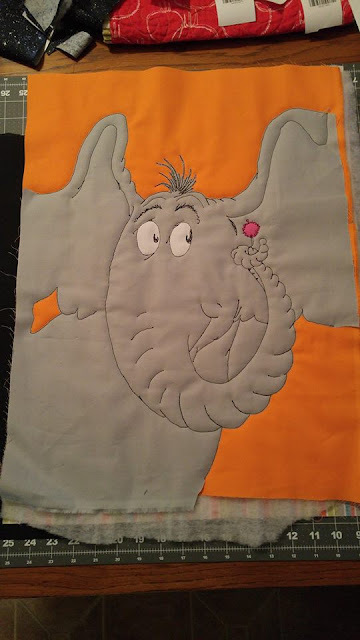 My goal was to create a mini quilt using an image of Horton. 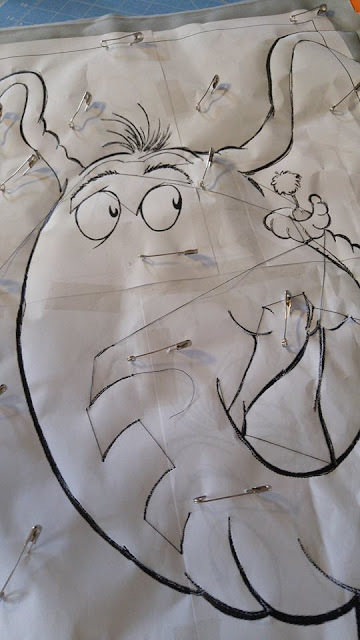 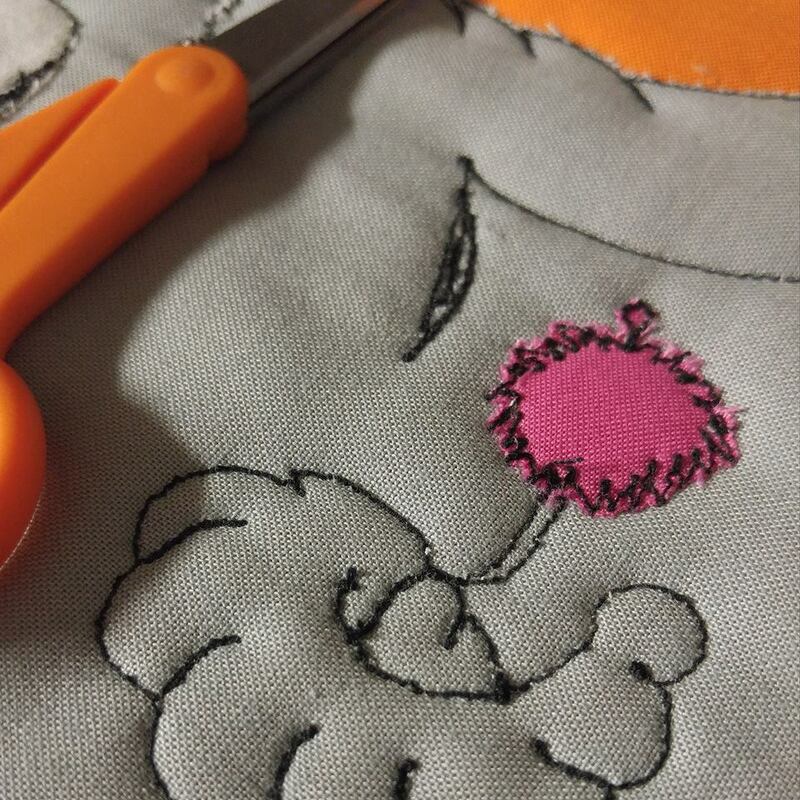 I decided to use the reverse applique method that I have tried a couple times before with good results. 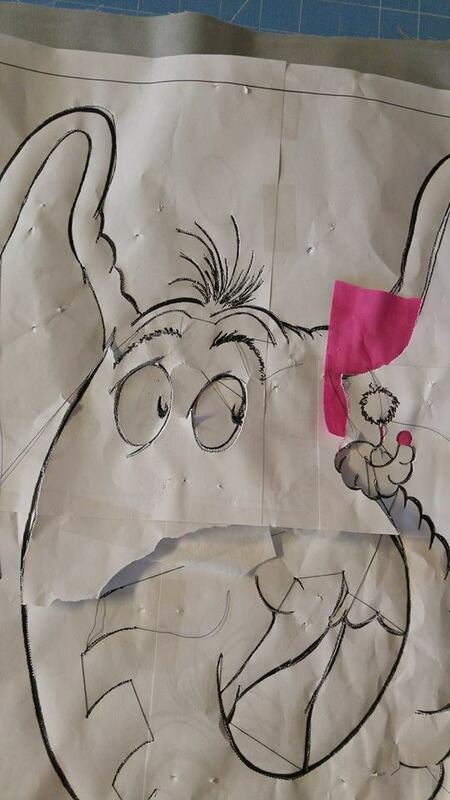 I found an image that I liked on the internet, and enlarged it to cover four sheets of paper. 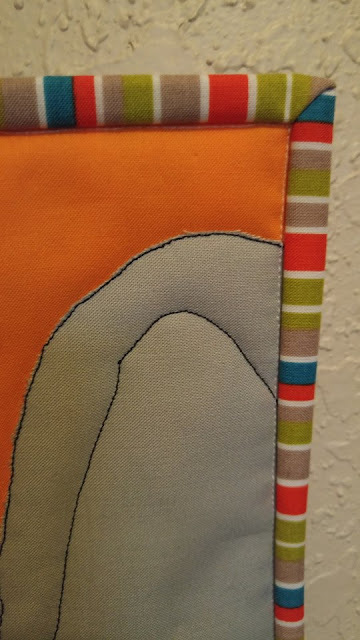 I pin basted my quilt sandwich with backing, batting, orange fabric, gray fabric, and the printed image on top. Then I used black thread and my darning foot on my Bernina Record 930 to trace the outline of Horton. 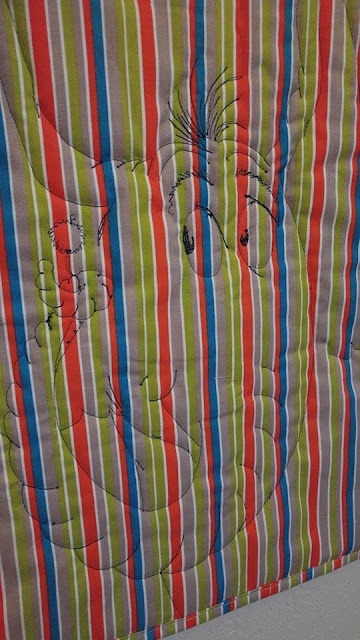 I left the eyes and the speck unquilted. 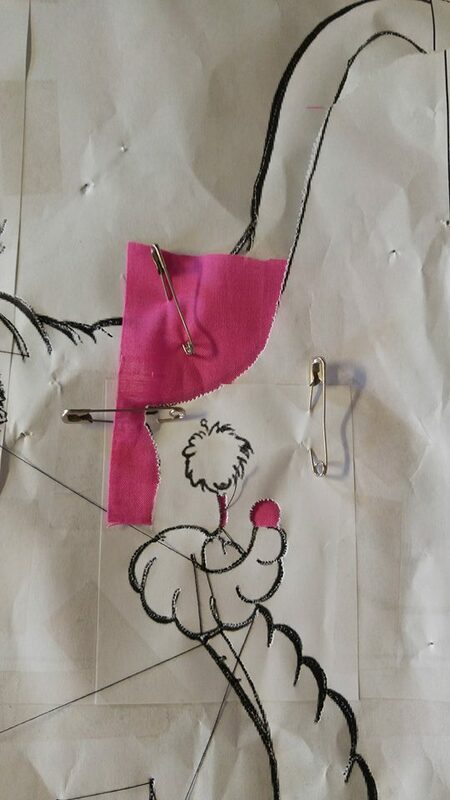 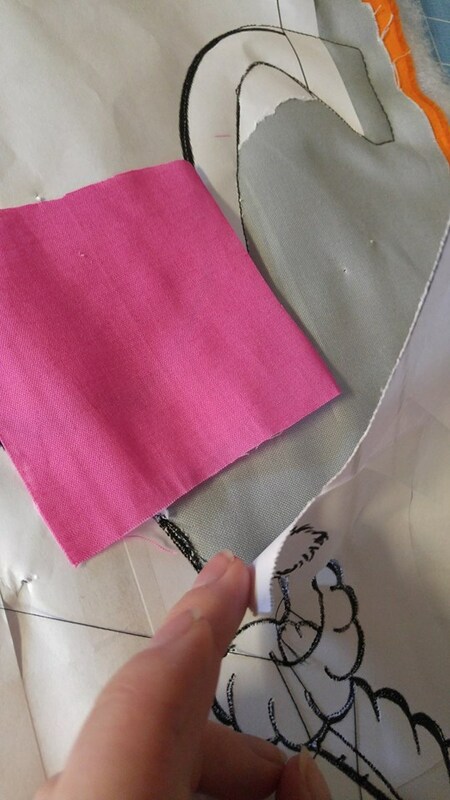 Then carefully peeled the paper up in those areas and placed the white and pink fabric underneath. 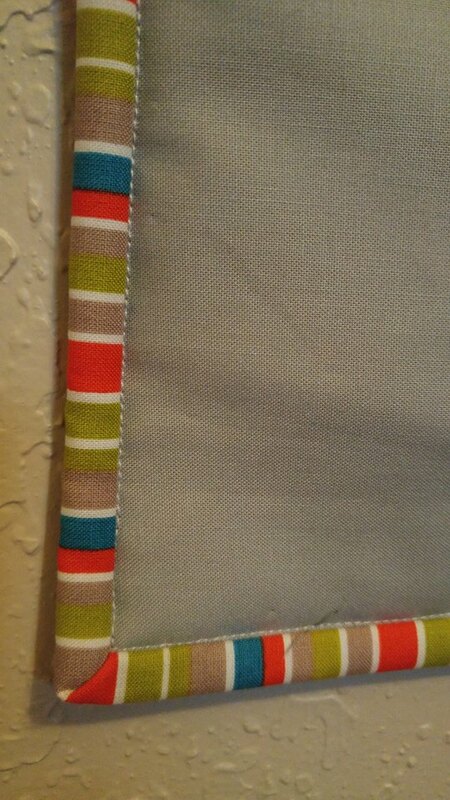 I pinned in place, then quilted them. 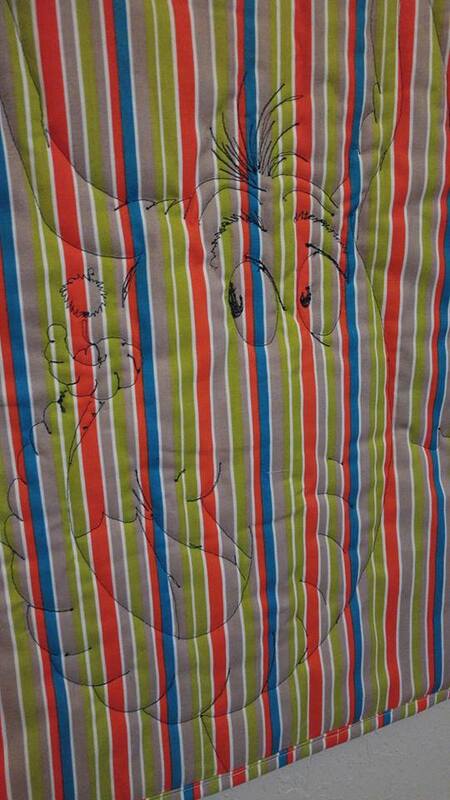 Here is the quilt after all the quilting was done and all the paper was removed. 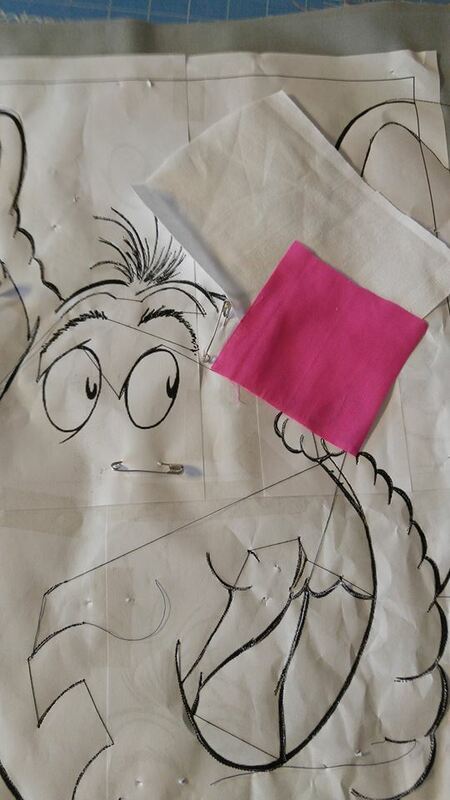 I cut away the excess fabric around the speck and eyes. 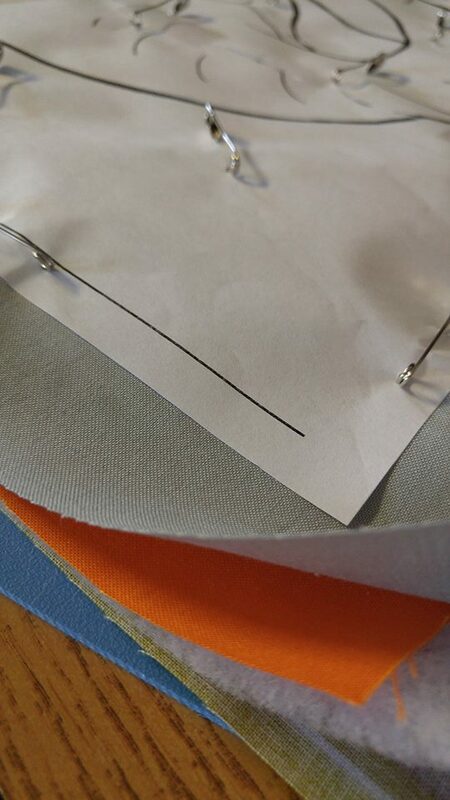 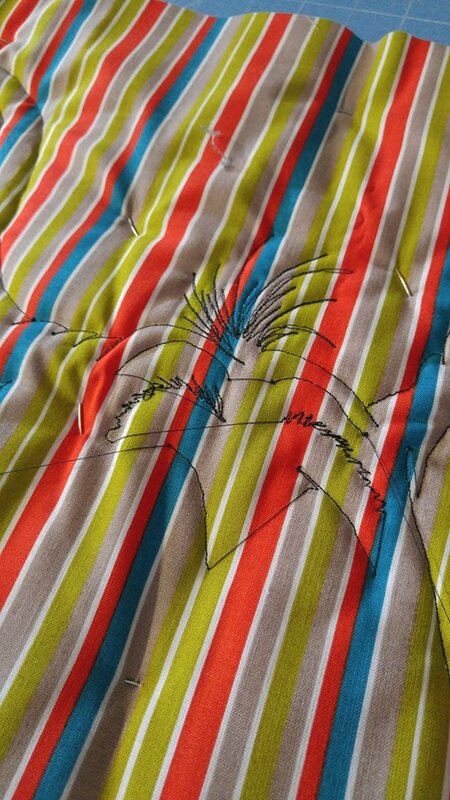 Then cut the excess gray fabric away next to the stitched lines, exposing the orange fabric underneath. I love how it turned out! 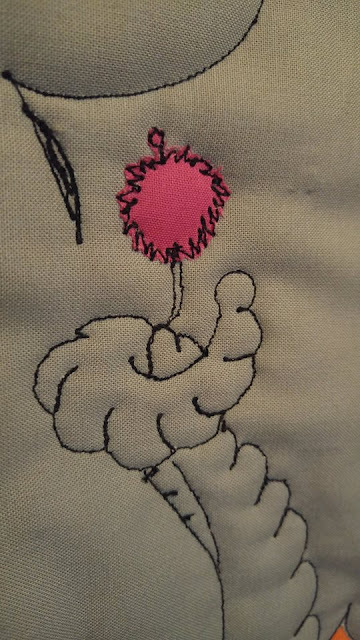 Every detail is my favorite. From the theme, to the fabrics, to the close-up parts. 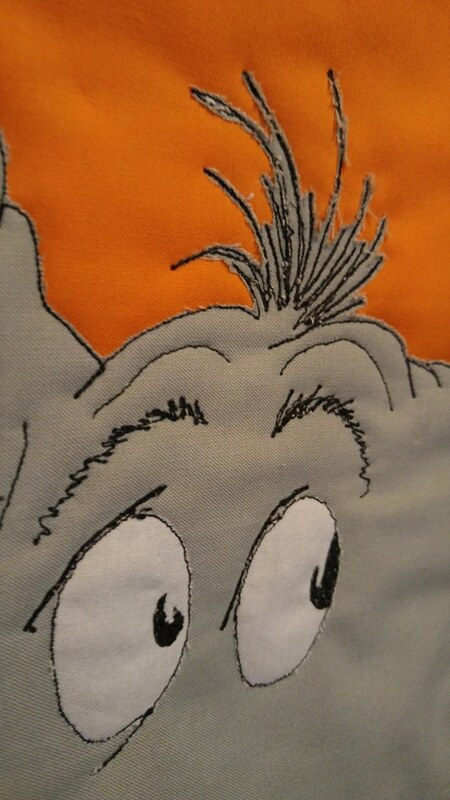 I love it all! I printed a fabric label to iron on the back (not pictured) and made a few "extras" to include with the quilt. 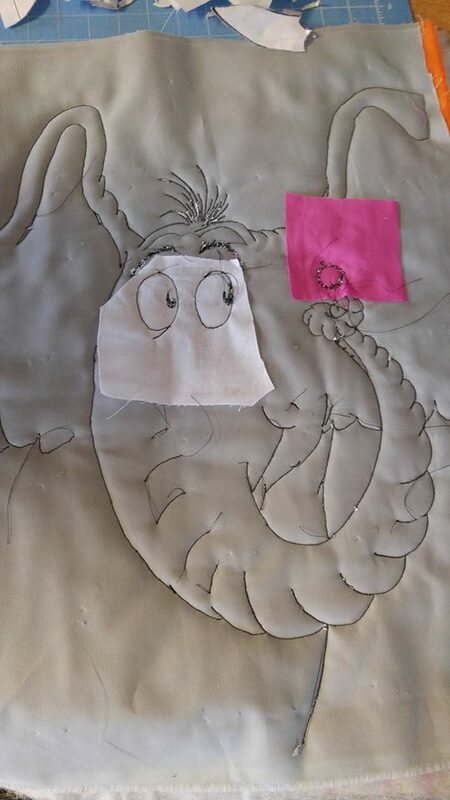 Now Horton is on his way to Canada! I love it, so stinkin' cute and creative!